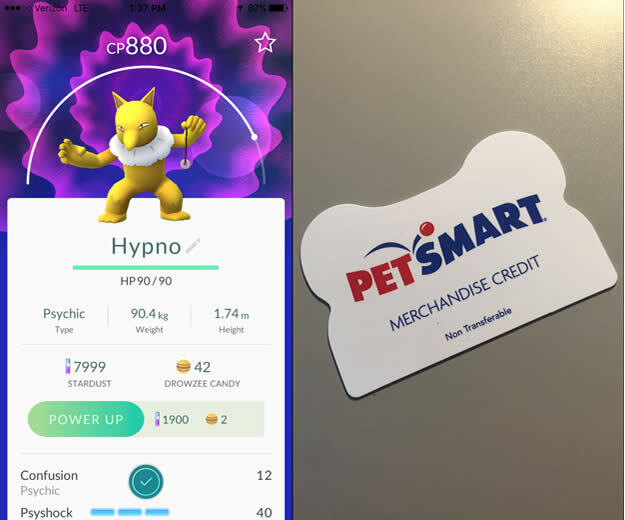 PetSmart proved it has smarts with Pokémon GO. I got a powerful Pokémon and a ten buck gift card by playing inside a PetSmart. Nice! I’m not sure if this was an isolated, local endeavor done on a whim or a franchise-wide effort, but as I walked into my town’s PetSmart on Sunday, I noticed a sandwich board by the door with something about Pokémon GO handwritten on it. I didn’t stop to read the details, but it did get me to open the app and I somehow managed to catch a sweet Hypno Pokémon with CP880 (that’s a good thing) in the litter box aisle while an amused stockboy watched me flailing around with my iPhone. This entry was posted in branding, going critical, social media and tagged apps, customer satisfaction, fads, litter boxes, opportunity, petsmart, pokemon, pokemon go, trends on July 25, 2016 by Clayton Hove.